Physically, FOTOCAT is an Excel file of UFO and IFO cases where an image has been obtained on photo, film or video. It contains various data columns to register the date, location and country, explanation (if one exists), photographer’s name, special photographic features, references, etc. When completed, the full catalogue will be posted in internet, for an indiscriminate access to the worldwide UFO community. The number of events cataloged at the time of writing (January 5, 2006) is: 6,192. 187 cases have been added since the last quarterly report, these were mainly recent reports. The reader knows already that we plan to suspend contemporary entries since December 31, 2005 and concentrate on older sightings. Witnesses of alleged unexplainable observations report ocasionally their recordings to us. I thank Ross Logli, who hails from Ravenshoe, Queensland (Australia), or Rodolfo Saucedo, living in El Paso, Texas, their kindness in sending their frequent photos and videos of UFOs over their home backyards. But we must take their sightings with a grain of salt, as we suspect from those fortunate mortals that claim to watch UFOs every now and then. Thanks are due to French Thierry Rocher, a veteran ufologist and writer, for contributing items on the big 1954 wave. Rare case material has been received from long-time friend and ufologist from New Jersey, Tom Benson. 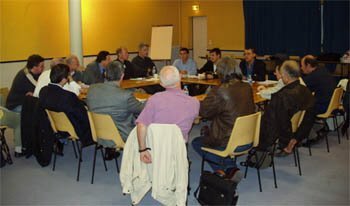 During the week-end of October 14-15, 2005, I was invited by the organizers of the First Encounters of European Ufologists at Châlons-en-Champagne (France) to deliver a speech there. At the same time, I attended the EuroUfo close-door meeting that had been set up with the occasion. EuroUfo is a network of some 50 researchers existing since 1998, grouping individuals and organization members for 7 national associations and several more different countries in Europe. To expand the present EuroUfo Internet list network to other researchers and groups in Europe, who are producing research, and create a portal web site to share information on work in progress, results, etc. A partial view of the participants to the EuroUfo meetings. Maurizio Verga from CISU (Italy) has provided a disk with all the pictures contained in his outstanding PHOTOCAT listing for UFO photos taken in Italy. Swiss chemist Bruno Mancusi confirmed he is preparing the Switzerland input for FOTOCAT. Experienced French researcher Jacques Scornaux from the CNEAU group (focused on the archive preservation concept) is collecting the pertinent information from the files of retired UFO photographic expert Michel Monnerie. The group of members from CNEGU, under coordination volunteered by Raoul Robé, are checking the current French FOTOCAT and contributing additional information. As others colleagues have also promised their own data, I conclude that the output of this EuroUfo meeting has been more than fruitful from our pet project perspective, and I expect a quantitative and qualitative jump in FOTOCAT in the short term because of that. On November 5 and 6, 2005, the annual conference of MUFON-CES had place in Ludwigsburg, Germany. Under the solid leadership of physicist Illobrand Von Ludwiger, this association centers on case inquiry and on theoretical physics approaches to the UFO phenomenon. Generally oriented to the indisputable reality of UFOs, there is no doubt that the abundance of doctors in sciences and engineers in the group is neatly over the average. MUFON-CES has published one dozen of their congress proceedings, unfortunately only one of these in English. I was present in their last member’s meeting, with the attendance of over 60 persons, because Mr. Ludwiger had kindly invited me to give a lecture. A number of interesting speeches were offered, with the formal format of a follow-up technical discussion. Amongst them, I will highlight one especially here because of their relationship with UFO photography. Wolfgang Stelzig and the Sky Scan prototype. Wolfgang Stelzig is an engineer with Bosch who has designed and built a stereoscopic photographic device to capture images of potential UFOs, if they appear in the environment of a location where this observation and recording unit is installed. A working prototype is under development now and ready to be tested. A 360º fish eye, automated camera covers the surrounding space during the 24 hours (it works at 1 frame/second). When a moving target appears, the camera sensors instruct a pan-tilt mechanism to place two digital cameras in the right position to take photographs of the target at the rate of 2-3 frames per second. It provides a stereoscopic view that also allows determining some objective magnitudes like the distance to the moving target. Recorded data are stored in a state-of-the-art computer. However, due to the low sensitivity of the currently-used camera, the device has a limited performance at night-time. As soon as more sensitive cameras and funding are available, this problem could be easily solved. This invention is a good technological tool for scientific-oriented UFO research and we applaud Wolfgang Stelzig and MUFON-CES for this accomplishment. This is the accidental picture with the UFO-like light trails. And this is the deliberate photo. This time, the photograph received is not a properly UFO, yet it is an image that can help to the UFO students, especially those young or short-experienced in this business. It is a ghostly photo taken in Florence (Italy) by the Spain-adopted, British researcher Chris Aubeck. Chris works in the collection of material on “Magonia UFOs”, this is, old time legends and stories having to do with present-time UFO sightings. His web site http://embark.to/magonia is one I advise to consult. Now I have queried FOTOCAT to divide it according to the typical UFO and IFO classifications. 3,842 cases have not been explained, at least to my knowledge (62%), and the remaining 2,350 reports are IFOs (38%). My intention is to review if these proportions are stable in a country-by-country analysis. With this purpose, I have prepared the table above which shows the countries contributing 2% or more entries to the catalogue (i.e., over 125 incidents). 13 countries are listed. These add up 5,187 cases, or 84% of the total data base content. In only one source-country (Spain), the percent of IFO reports exceeds that of UFOs, with 59%. It is followed by Mexico, where IFOs score 47% of total. In the 30% to 40% range are the USA, Italy and Chile with 39%, closely followed by France (38%) and United Kingdom (33%). The remaining 6 countries show IFO counts from 20% to 30%. My impression is that ufologists have not employed their best resources yet to scientifically analyze photographic UFO material. Why? There are two main reasons. In Spain we have worked rather intensely in the study of this type of reports and, although we are conscious that much work is still pending to be done, the Spanish ufological labor base succeeded in explaining 59% of the cases so far. Secondly, if I take from FOTOCAT those cases labeled SPACE, this is, those events reported to have been witnessed and filmed from orbiting spacecraft, the rates revealed are 64% for IFOs (52 cases) and 36% for UFOs (29 cases). Considering the special nature of those events -the official evidence acquired by astronauts and unmanned spacecraft-, those cases have received higher analytical attention than others. Being this the case, the IFO proportion of 64% marks a horizon for reasonability in terms of expected rate of explained cases in any other sample. The fact that the present catalogue shows that explained events only reach 38% in average clearly indicates, in my opinion, that critical UFO research has been very limited in this field and that a lot of unbiased study work is still required to compensate this failure. One more time we suggest the reading of an article by the Italian astrophysicist Dr. Massimo Teodorani. It is entitled “IEA 2003 Report: Optical Investigation of Anomalous Light Phenomena in the Arizona Desert”. A group of scientists composed of geophysicist Marsha Adams, technological scientist Erling Strand, and myself conducted a scientific mission to the Arizona desert in April 2003. The goal of the expedition was to test on-field team-work in difficult areas where anomalous light-phenomena have been observed, and to acquire data using several instruments including magnetometers, VLF receivers, radioactivity detectors, a weather station and optical tools for photography, video and spectroscopy. This report is the description of the results that came from the screening of optical data, which were acquired and subsequently analyzed by this author. The analysis of digital and 35mm film photographs is presented in detail. 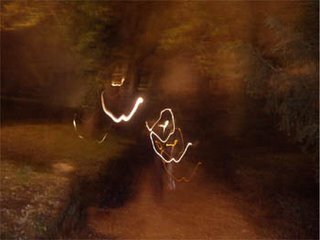 Three categories of lights were classified: conventional lights, unidentified lights and highly probable “anomalous cases”. Almost all the obtained spectra are due to well-known artificial lights. Finally, tests with a high-resolution spectrograph and optical tests with a reflector telescope are described. This site also includes an extremely well documented section on the apparition of sounding balloons in the world that have cause misinterpretations with UFOs, and I recommend the reader not to miss it: “Sucesos OVNI relacionados” (related UFO events). A first-class job. There has been published in French the article “L’Année 1954 en Photos”, La Gazette Fortéenne, Volume IV, 2005, pages 99-133. This is version #4 of a paper first released in 2004 on http://www.ikaros.org.es/fotocat1954.pdf and originally entitled “The 1954 Year in Photos”. The French, enlarged version contains reproductions of the photographs. En el último trimestre se han incorporado 187 casos al registro, la mayoría recientes. El lector ya sabe que desde el 31 de diciembre de 2005 suspenderé la entrada de casos posteriores a esa fecha para concentrarme en la adquisición de casos antiguos. Ocasionalmente, testigos de supuestas observaciones inexplicables nos informan de sus logros. Quiero agradecer a Ross Logli, que nos ha escrito desde Ravenshoe, Queensland (Australia), y a Rodolfo Saucedo, que vive en El Paso, Texas, su amabilidad al mandarnos las fotos y videos de los ovnis que frecuentemente divisan desde sus residencias. Pero debo decir que estos casos los tomo con gran escepticismo, ya que sospecho de estos afortunados mortales que dicen poder ver ovnis cada dos por tres. Mi agradecimiento también al investigador y autor francés Thierry Rocher, que ha aportado interesante material acerca de la gran oleada de 1954. Un viejo amigo y ufólogo de New Jersey, Tom Benson, ha remitido material difícil de encontrar. Durante el fin de semana del 14 y 15 de octubre de 2005, fui invitado por los organizadores del Primer Encuentro de Ufólogos Europeos de Châlons-en-Champagne a dar una conferencia. Al mismo tiempo, EuroUfo aptrovechó la ocasión para organizar allí una reunión a puerta cerrada. Esta es una red de medio centenar de investigadores europeos creada en 1998 y que agrupa tanto a estudiosos privados como a organizaciones, habiendo siete asociaciones nacionales y varios países más de Europa representados entre sus miembros. Vista parcial de una de las reuniones de EuroUfo. Durante las reuniones de EuroUfo distribuí entre los 23 investigadores asistentes una copia del informe “FOTOCAT´s Overview Paper”, que puede leerse en la sección de Documentos del presente blog. Quedé sumamente complacido por la respuesta recibida de los participantes. Así, Maurizio Verga del CISU italiano nos ha remitido un CD que incluye todas las fotografías de su sobresaliente catálogo PHOTOCAT, que reúne la casuística fotográfica de Italia. El químico suizo Bruno Mancusi nos ha confirmado que está preparando un listado de los casos de Suiza para su ingreso en FOTOCAT. El experimentado investigador y autor francés Jacques Scornaux del grupo CNEAU (dirigido principalmente a la recuperación de archivos) nos está ayudando con los archivos del ya retirado experto en casos fotográficos Michel Monnerie. De otro lado, el colectivo CNEGU, bajo la colaboración voluntaria de Raoul Robé, está revisando el contenido francés de nuestro FOTOCAT y aportando interesante información suplementaria. Como otros colegas nos han prometido también ayuda, puedo concluir que el resultado de este encuentro de algunos de los miembros de EuroUfo ha sido más que fructífero desde la perspectiva de nuestro proyecto y espero a corto plazo un salto cuantitativo y cualitativo en FOTOCAT. La conferencia anual del MUFON-CES se celebró entre el 5 y 6 de noviembre de 2005 en Ludwigsburg, Alemania. Bajo la sólida dirección del físico Illobrand Von Ludwiger, esta asociación alemana se centra en investigación de campo y en enfoques de física teórica al fenómeno ovni. Orientados en general a la innegable realidad de los ovnis, no hay duda que el número de doctorados en ciencias e ingenieros entre sus miembros supera con creces la media de otros grupos en el mundo. MUFON-CES ha publicado una docena de las actas de sus congresos, aunque todas en alemán, excepto un volumen en inglés. Estuve presente en su último congreso, en el que asistieron más de 60 personas, porque mi amigo Ludwiger tuvo la gentileza de invitarme a darles una charla. Varias interesantes disertaciones se dieron a lo largo del fin de semana, usando el formato formal de una discusión técnica tras cada conferencia. De todas ellas voy a resaltar una especialmente por su relación con la fotografía ovni. 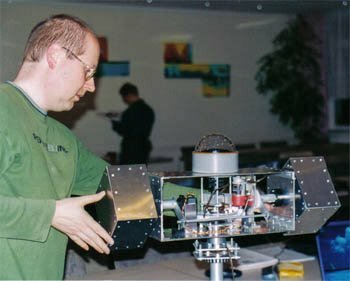 Wolfgang Stelzig y el prototipo de su aparato de detección Sky Scan. Wolfgang Stelzig es un ingeniero de la empresa Bosch que ha diseñado y construido un equipo de fotografía estereoscópica para capturar imágenes de potenciales ovnis, si aparecen en el entorno del emplazamiento de una de estas unidades de observación y registro. Un prototipo está bajo desarrollo y listo para su testeo. Una cámara automática de ojo de pez (360º) cubre el espacio circundante durante las 24 horas. La cámara trabaja a 1 exposición por segundo. Cuando aparece un blanco volante, los sensores de la cámara instruyen a un mecanismo basculante que posiciona dos cámaras digitales en la posición adecuada para sacar fotografías del objetivo a una velocidad de 2-3 por segundo. Éstas aportan una vista estereoscópica (tres dimensiones) que a la vez permite determinar algunas magnitudes objetivas como la distancia al objeto fotografiado. Los datos quedan registrados en el disco duro de un ordenador de última generación. Sin embargo, dada la baja sensibilidad de la cámara usada actualmente, el equipo tiene un desempeño limitado durante la noche. Tan pronto como se disponga de cámaras más sensibles y de mayor financiación, este problema tendrá fácil solución. Este invento supone una buena herramienta tecnológica para el estudio científico de los ovnis y por ello aplaudimos a Wolfgang Stelzig y al MUFON-CES por tal logro. 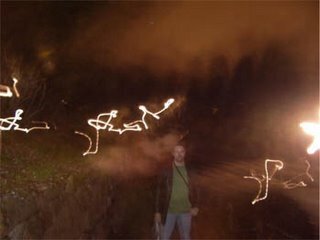 La fotografía accidental con los trazos luminosos que asemejan ovnis. La foto que se hizo deliberadamente. En esta ocasión, la fotografía recibida no es propiamente de un ovni, pero es una imagen que puede ayudar a los estudiosos de los ovnis, especialmente aquellos más jóvenes o menos experimentados en esta materia. Es una fantasmal fotografía conseguida en Florencia (Italia) por el ufólogo británico, afincado en España, Chris Aubeck. Chris se ha especializado en la recopilación de material que llamaríamos “ovnis de Magonia”, esto es, antiguas leyendas y narraciones que se interpreta pueden tener que ver con lo que hoy denominados fenómeno ovni. Aconsejo consultar su página web http://embark.to/magonia. “Siempre me había preguntado cómo se hacía este tipo de foto, una que veo frecuentemente en revistas sensacionalistas como prueba de visitas fantasmales. Y resulta que he creado una por accidente. La segunda foto que adjunto la hice posteriormente de forma intencionada para asegurarme que podía recrear el efecto”. “Me doy cuenta de que estos efectos son bien conocidos y apenas suponen un secreto para nadie, pero me impresionó lo fácil que era crear esas imágenes y como tales fotos son comúnmente usados para propósitos esotéricos. Si sigues los trazos en la fotografía accidental verás como uno parece incluso pasar por detrás de un árbol, algo que alguno interpretaría como prueba de que gusanos luminosos se nos aparecieron realmente”. He dividido los casos del catálogo FOTOCAT de acuerdo con la clasificación clásica de explicado (OVI) e inexplicado (OVNI). Tenemos 3,842 casos sin explicación, al menos que yo sepa, lo que supone un 62% y los restantes 2,350 informes están explicados, que supone el 38%. Mi intención consiste en ver si esas proporciones son estables en un análisis país por país. Con ese propósito he listado el catálogo según los países con más del 2% del total, esto es, con más de 125 casos. Véase la tabla superior. Aparecen 13 naciones. Éstas suman nada menos que 5,187 casos, el 84% de la totalidad del contenido de la base de datos. En sólo un país, España, el porcentaje de sucesos explicados supera al de OVNIS (inexplicados), con el 59%. Le sigue México, donde los explicados alcanzan el 47%. En el rango entre 30% y 40% de informes explicados están los Estados Unidos, Italia y Chile, con el 39%, seguidos de cerca por Francia con 38% e Inglaterra con 33%. Los seis restantes estados muestran porcentajes de OVIS entre el 20% y el 30%. Mi impresión es que los ufólogos no han empleado todavía sus mejores recursos para una investigación científica y objetiva del material fotográfico sobre avistamientos de ovnis. Lo creo por dos razones. Una es que en España nos hemos afanado bastante en estudiar este tipo de informes y, aunque somos conscientes del mucho trabajo que resta por hacer, la comunidad ufológica española ha conseguido resolver el 59% de los casos hasta el presente. La otra es que, si extraigo de FOTOCAT aquellos casos rotulados como ESPACIO en la columna dedicada al código nacional, esto es, los sucesos que han sido observados y filmados por astronautas y desde naves espaciales de las superpotencias, los resultados revelan que el 64% (52 casos) corresponde a fenómenos explicados y el 36% persisten como presuntos ovnis (29 casos). Considerando la naturaleza especial de estos eventos, dotados de evidencia oficial adquirida por astronautas y desde satélites en órbita, esos casos han recibido una mayor atención analítica que otros. Siendo este el caso, la proporción de fenómenos explicados del 64% puede marcar un horizonte razonable en términos de tasa esperada de casos con explicación en cualquier otra muestra. Así pues, el hecho de que el actual catálogo muestre que la media de casos explicados es sólo del 38% indica claramente, en mi opinión, que el empleo de una ufología crítica ha sido muy limitada en esta casuística y que queda mucho trabajo por hacer para compensar esa deficiencia. Una vez más sugerimos la lectura de un artículo del astrofísico italiano Dr. Massimo Teodorani. Se titula en inglés “IEA 2003 Report: Optical Investigation of Anomalous Light Phenomena in the Arizona Desert”, que se traduce al castellano como “Informe IEA de 2003: Investigación óptica de fenómenos luminosos anómalos”. Un grupo de científicos compuesto por la geofísica Marsha Adams, el científico tecnológico Erling Strand y yo mismo, conducimos una misión científica al desierto de Arizona en abril de 2003. La meta de la expedición fue comprobar sobre el terrero pautas de trabajo en equipo en zonas difíciles donde se habían observado fenómenos luminosos anómalos y adquirir datos usando varios instrumentos como magnetómetros, receptores VLF, detectores de radioactividad, una estación meteorológica, así como útiles ópticos para fotografía, video y análisis espectrográfico. Este informe es la descripción de los resultados obtenidos del estudio de los datos ópticos, que fueron conseguidos y posteriormente analizados por este autor. El análisis de fotografías digitales y de 35 mm se presenta en detalle. Se clasificaron tres categorías de luces: luces convencionales, luces no identificadas y altamente probables “casos anómalos”. Casi todos los espectros obtenidos se deben a luces artificiales conocidas. El trabajo se cierra con la descripción de las pruebas realizadas con un espectrógrafo de alta resolución y con un telescopio reflector. Este sitio tiene la virtualidad de incluir un documentadísimo apartado sobre apariciones de globos sonda en el mundo que han sido tomados por ovnis, que les recomiendo que no se pierdan: “Sucesos OVNI relacionados”. Un trabajo de primera clase. Esta revista anual puede conseguirse escribiendo a su editor-en-jefe, Jean-Luc Rivera, a través de su email JLRIV1@aol.com, o bien escribiendo a la editorial: Les Éditions de L’Oeil du Sphinx, 36-42 Rue de la Villette, 75019 Paris, Francia.